We have chosen to live a rather unconventional lifestyle. We live in a "home on wheels" — a motorhome. Motorhome living is not for everybody. In fact, we certainly don't recommend this lifestyle for those who need to have a stationary home, but it certainly fits us to a tee. It's a wonderful feeling for us to wake up each morning and "take off" to a new destination. When we find an area of our country that we would like to investigate further, we simply stay as long as we please. If we've seen all that we want, or if the area is not that desirable for us, we travel onward. 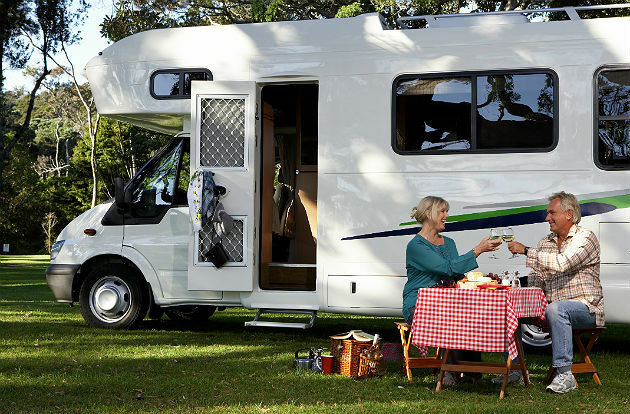 The first thing you have to remember when choosing to make an RV your home is to keep things simple, as there is not really enough room for lots of frills. However, if you pack well and prepare yourself with the right mindset for this kind of life, there is ample space for all you need to be comfortable. We didn't always live in a motorhome. In fact, we downsized quite a bit to fit everything in. What we actually learned through this downsizing process is that we can be happy with the simple things; that we don't need all the "bells and whistles" to make us comfortable. Every area of our motorhome has a unique purpose. There is a place for everything, and everything has its place. Our decor consists of a bulletin board of family photos, a couple of small lamps and flameless scented candles. We have to remember that everything we set out has to be secured when we're on the road. Thus, personal decorator items are kept to a minimum. We're happy to take in the scenic views over a painting of landscape any day. We have added some "extras" to make our motorhome living more comfortable for us. Even though most campgrounds have campfire rings, we opt to use our small propane-fueled fire ring, which eliminates the smoky smell, embers floating through the air and ash residue. We often use a small bottle-propane grill for cooking a lot of our dinners. A custom-made windshield cover helps keep the blazing sunlight from streaming in, but we can still easily see out. A couple of padded lawn chairs offer a comfortable place to sit on our patio or around our propane fire ring. A doormat at our door serves to welcome guests, as well as a functional place to wipe our feet before entering our RV. All of these items pack up easily and are stored efficiently in our undercarriage basement. Our motorhome is a unique option for living quarters, but comfortable nonetheless. We have adapted well to this simple lifestyle and enjoy every aspect of it. Keeping things simple proves to be ample enough for us. Laura Weaver is a freelance writer who travels extensively with her husband and dog in an RV. She enjoys writing about a number of subjects, including her RV travels. Believing everyone has a story to share, she especially enjoys writing about true life experiences.